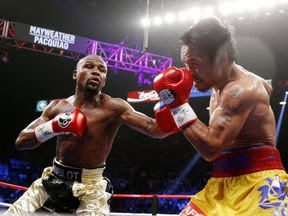 Floyd Mayweather has said he is coming out of retirement for a rematch with Manny Pacquiao. The undefeated American boxer posted an Instagram video of the pair meeting informally at what appeared to be a music event. They exchange words but it is hard to hear exactly what is said. Mayweather posted: "I'm coming back to fight Manny Pacquiao this year. Another 9 figure pay day on the way @mayweatherpromotions." Filipino fighter Pacquiao has so far not commented, and there has been no official confirmation or other details released.